The road towards a new Yankee Stadium actually began with bat days in the early 1970s. The sell-out promotion, beloved by fans and a favorite of newspaper photographers, brought will it a ritual by which young fans with tap their bats in unison against the concrete beneath their feet, hoping to stir a Yankee rally. The pounding created a dangerous situation of falling concrete chips from the mezzanine and upper decks. No one was ever hurt, but Yankee officials were prompted to bring in building engineers for an evaluation. The conclusion: Yankee Stadium was beginning to fall apart. By 1973 it would be 50 years old. By building standards of the 1920s, that was a good run. And so Michael Burke, who ran the Yankees for the CBS ownership, went to Mayor John Lindsay to report on the Yankees needs. Lindsay knew and cared little about baseball, but he did know that he didn’t want the Yankees packing up and leaving on his watch. The two men, Burke and Lindsay, had similar styles and got on well together. They eventually hatched a plan under which the city would condemn the existing structure, acquire it, and finance the rebuilding. It would cease to be owned by the team. $24 million was pulled out of the air as the price: the figure that it cost to build Shea Stadium a decade earlier. It would eventually top $100 million. Inflation wasn’t kind to ballpark planning. They would take on the project after the 1973 season – the park’s 50th anniversary. It would take two and a half years to rebuild. In the meantime, the Yankees would share Shea Stadium, as guests of the Mets, as they had shared the Polo Grounds, guests of the Giants, from 1913-1922. I was the assistant public relations director reporting to the legendary Bob Fishel when we announced this early in 1972 during our promotional tour of the northeast we called our annual Yankee Caravan. By the time the ’72 Yearbook was published, we had an architects rendering available. To Mike Burke’s credit, he fought and clawed with the city and insisted that the historical façade design remain, albeit across the outfield billboards, as the new roof would not support an exact match. Burke held firm; the city gave in, and the design survived. It was perhaps his greatest legacy to the project. I played a small role in the upcoming plans by writing a memo to general manager Lee MacPhail, suggesting that we look into existing office space in Flushing Meadow Park, across from Shea, for use in the coming years. He acted on it at once and the city moved us to the offices formerly used by Robert Moses and his team in running the World’s Fair of 1964-65. In January, 1973, the group headed by George M. Steinbrenner III purchased the Yankees from CBS and inherited the rebuilding plan. Gabe Paul would be the one to occupy Moses’ personal office. The 1973 season, the 50th anniversary, found the Yankees wearing handsome patches on their sleeves that captured the majesty of the façade looking in from centerfield. The end of the flannel era had arrived. It the first year of new double-knit uniforms, the Yankees (and Giants) being the last to conform to the new look. The team played well for much of the season, with Bobby Murcer and Ron Blomberg landing on the cover of Sports Illustrated in mid-year as leaders of the pennant charge. But alas, the team couldn’t hold it together, and collapsed badly in the final weeks, destined to finish fourth with an 80-82 record. The final game was September 30. Everyone in attendance received a record album with the “Sounds of 50 Years of Yankee Stadium,” which I had written and which Mel Allen narrated. I had my eyes of a piece of memorabilia that I coveted – the cushioned panel in right field that said 296. I wanted it to go to Cooperstown. I also asked Pete Sheehy, our veteran clubhouse man, to keep an eye on the clubhouse valuables safe with the names of the 1903 Highlanders on each draw. It was our only possession that went back to the beginning of the franchise. No one to this day knows what became of the safe or of the panel. At the final game, 32,328 showed up. Among them: John Drebinger, who covered the game for New York Times, as he had in 1923 when the Stadium opened. The game was uneventful. The Yankees lost 8-5 to Detroit, with Duke Sims, the Yankees catcher, hitting the last home run. In a six-run Tiger eighth, Ralph Houk was forced to walk to the mound to remove Lindy McDaniel, to a chorus of boos. Fishel told me how much it hurt him that Houk had to make that trip, knowing the fans had so turned on him and would so reign boos upon him. After the game: a blockbuster – Houk quit. Still in uniform, tears in his eyes after 34 years in the organization, he walked away. He would soon be managing Detroit. While the press conference was going on, an estimated 20,000 fans were all over the field, some carrying the seats they had pulled and twisted out of the concrete, breaking the steel legs off in the process. What was salvageable was acquired by the department store E.J. Korvette’s and sold for $7.50 a seat. (Plus five end flaps from boxes of Winston cigarettes). They go for much more today. In fact, there really was no memorabilia industry in 1973. A handful of collectors made deals with the Yankees to clean out some of the old photos, trophies, file cabinets and dust collectors from the basement storage rooms. Smart people. The next morning, with the Stadium looking like a war zone, a ceremony was held, with Mayor Lindsay presenting first base to Mrs. Lou Gehrig and home plate to Mrs. Babe Ruth. And as the dignitaries departed, demolition work began. 105 pillars would be removed (including the one I sat behind during football Giants games). The engineering feat of supporting stacked decks and a roof without pillars was not available in 1923. This would be the major structural difference. The outer shell would remain, but the inner Stadium would feel new and modern. As we played our two seasons at Shea, (I succeeded Fishel during this time), work progressed on schedule up in the Bronx. A ticket kiosk went to the Smithsonian. The foul poles went to a Japanese stadium. The monuments and plaques were carefully stored for what would be the new monument park. Periodically, as PR director, I would lead a small band of writers, all in hard hats, on progress tours. It felt so good to be there, even though it was a sea of mud and chaos. On one occasion, we were met by Mike Kekich, a former pitcher, who had heard about the little excursion and wished to see the progress. Just before spring training of 1976, we did our final tour. At a photographer’s request, I threw a pitch from where the mound would be. Was it the first in the new park? I couldn’t say for sure. I suspect the workmen had some fun during breaks. We opened on April 18, 1976. Not everything was ready, but it was ready enough. George Steinbrenner personally choreographed the ceremonies, inviting not only Mrs. Ruth, Mrs. Gehrig, Joe DiMaggio Mickey Mantle, Yogi Berra, Phil Rizzuto, and Don Larsen, but Joe Louis who fought there, Frank Gifford, Kyle Rote, Johnny Lujack, Weeb Ewbank and Arnold Tucker who played and coached football there, and others who were part of the great history. Bob Shawkey, the opening day pitcher in 1923, was able to throw out the first pitch. 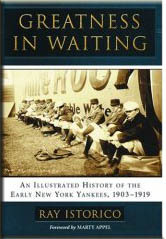 Whitey Witt, the Yankees leadoff hitter in ’23, stood at the plate, as their teammates Waite Hoyt, Joe Dugan, Hinkey Haines and Oscar Roettger looked on. Behind Shawkey on the mound were four “special” guests chosen by Steinbrenner – Toots Shor, the restaurateur to the sports crowd, Pete Sheehy, after whom the clubhouse was officially named that very day, Jim Farley, the former postmaster general and the team’s oldest continuous season ticket holder, (he would die seven weeks later), and Mel Allen, the long time “Voice of the Yankees.” It was a very nice touch. Robert Merrill sang the national anthem and Bobby Richardson delivered an invocation. Terrance Cardinal Cooke offered a blessing. Everyone at the sellout game got a reprint of the original opening day of 1923 program. The scoreboard was not fully operational, so lineups could not be posted, but the score by innings board worked fine. As for the game, in brutally hot weather for April, the Yankees beat the Twins, but sadly (to me), Dan Ford of the Twins hit the first home run, not a Yankee, not a modern successor to Babe Ruth, who had christened the place in ’23. As the PR man, it was a crazed day. While I was on the field coordinating the program with Bob Sheppard, there were union problems which kept the gates shut until just 90 minutes before game time. We had a new centerfielder in Mickey Rivers, a new second baseman in Willie Randolph, a new captain in Thurman Munson, and manager Billy Martin promised good things. He was right. The team would win its first pennant in 12 years, and would scale 2 million in attendance, the first American League team to do so since the Yankees of 1950. This was the biggest renovation a ballpark had ever endured, but of course, it was built with the thought that perhaps two million fans would visit a year. No one anticipated that doubling and the needs that went with that. The old place lasted 51 seasons, the new one an additional 33. Say this for the new one: it brought forth its own, overflowing bank of great moments and happy times shared among fellow fans.